Senator John Kefalas accepts Friend of Higher Education Award. 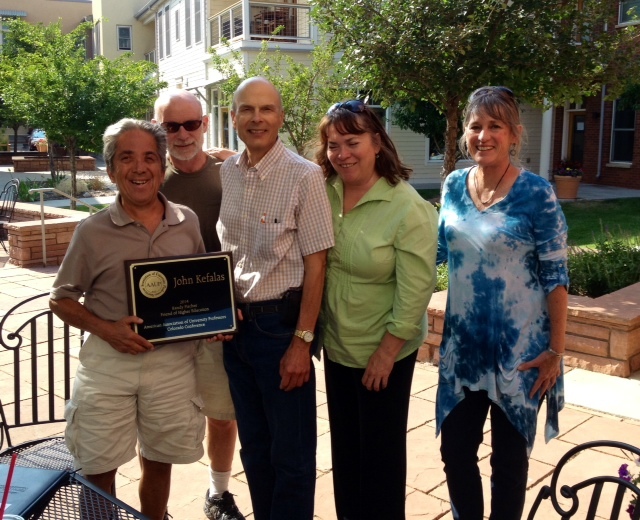 AAUP members present Colorado Senator John Kefalas with the Randy Fischer Friend of Higher Education Award on July 2, 2014. Pictured (left to right) are Senator Kefalas, Don Eron, Representative Randy Fischer, Caprice Lawless, and Suzanne Hudson. The AAUP Colorado Conference is proud to bestow its newly renamed Randy Fischer Friend of Higher Education Award on Colorado Senator John Kefalas (Senate District 14, Fort Collins). This award is presented annually by the AAUP’s Colorado Conference to honor Colorado legislators and elected public officials “whose legislative work and public service has significantly advanced civic understanding and public support of higher education in the State of Colorado.” The award recognizes Senator Kefalas for his indefatigable efforts on behalf of Colorado higher education institutions and faculty of all ranks and disciplines over a legislative career that spans six years in the Colorado General Assembly’s House of Representatives, continuing since 2013 as senator. He has proven himself a highly effective public servant and skilled listener who reaches across the aisle to build stakeholdership on issues of common interest to all Coloradoans irrespective of party labels. The AAUP is especially appreciative of Senator Kefalas advocacy and support of House Bill 12-1144 on Non-Tenure Track Teaching Contracts, which became law in April 2012, and his recent support for AAUP’s Community College Pay Equity bill (HB14-1154) that Randy Fischer introduced at the General Assembly this year (John Kefalas co-sponsor in the Senate). AAUP Colorado Conference looks forward to working with Senator Kefalas on this issue and others in the 2015 legislative session and beyond. ← The most influential AAUP state caucus in America.